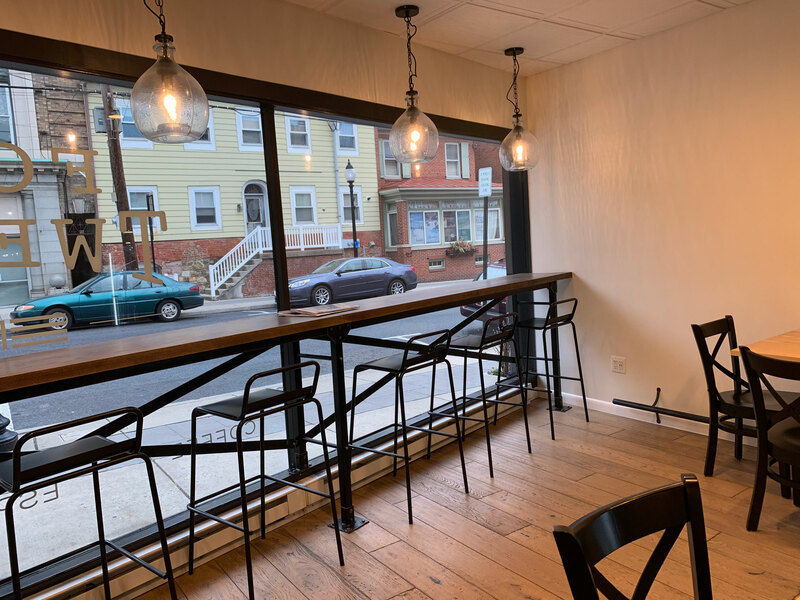 Through this blog, I have been able to explore all corners of Berks County and beyond. It’s hard to spread the love around the county when there are so many deserving restaurants that I haven’t tried yet. One area of the county that I’ve been fortunate to explore more recently is Hamburg. We’ve done blogs in the past at their two great barbecue joints – Backwoods Brothers and Smokin’ Brays – and we’ve visited the long-established Westy. A month ago, we were in Hamburg for a very impressive dinner at the 1787 Brewing Company. 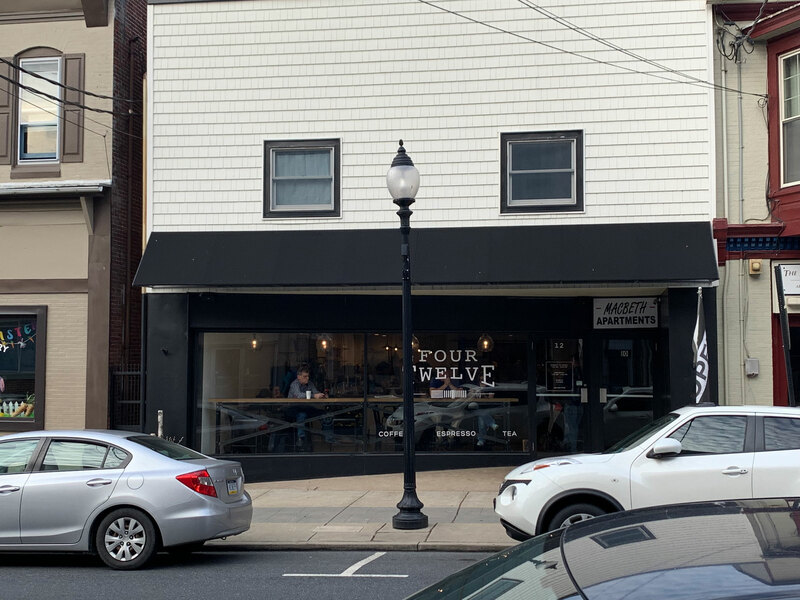 Then on a recent Saturday morning we were back again, almost across the street at Four Twelve. 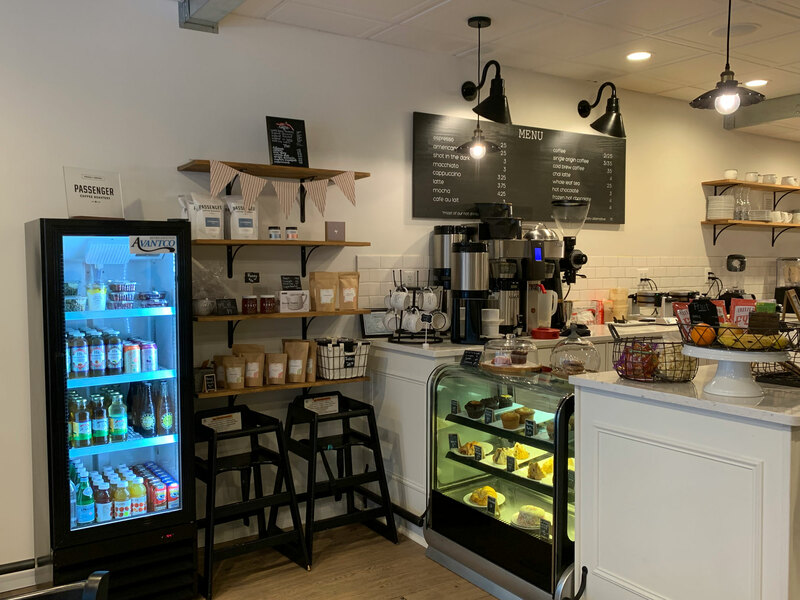 The coffee shop is located at 12 South Fourth Street (turn it around and you get Four Twelve) in the heart of Hamburg’s downtown business district. We arrived around 8 a.m. on Saturday morning, much later than our usual breakfast time so we were very hungry by the time we walked through the door. While standing in line I noticed the sign for Passenger Coffee, the Lancaster County brand that was named best coffee in Pennsylvania by Food & Wine.I don’t drink coffee, but that seems like a pretty good endorsement. The space feels very utilitarian – cold, in a way – with white walls and black accents. Floral centerpieces on the wood tables added a little color to an otherwise stark space. 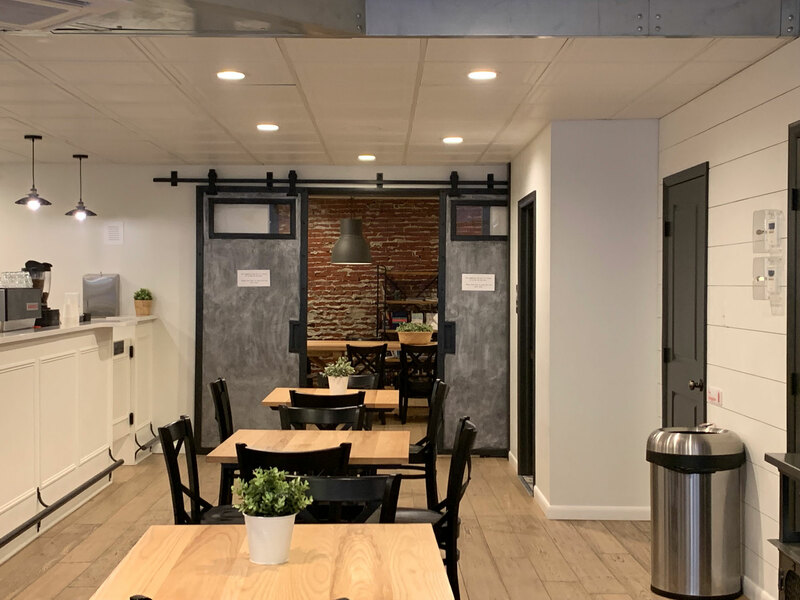 The exception to the rule was the community room, a small space in the back with an exposed brick wall that could be closed off for private functions. Shortly after placing our order at the counter, a 20-man running group entered the shop pushing the line to the door. As their conversations picked up, the room began to echo. The runners placed their orders one-by-one and as they took their seats around the room the spacious coffee shop felt much smaller. We were definitely fortunate to arrive in front of them. Though neither of us drink coffee, both Julie and I enjoy a good chai tea latte. They arrived to our table before our meals in large, well-used mugs. 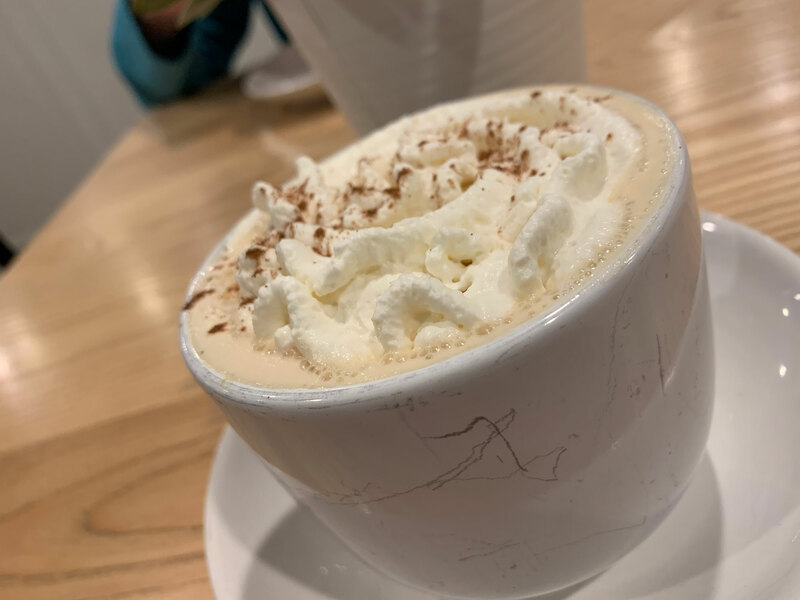 The chais were done beautifully, well spiced with plenty of whipped cream on top (Jakob especially enjoyed the whipped cream). It was several more minutes before our food arrived. Four Twelve is known for their waffles and waffle sandwiches and we had ordered a variety to try. 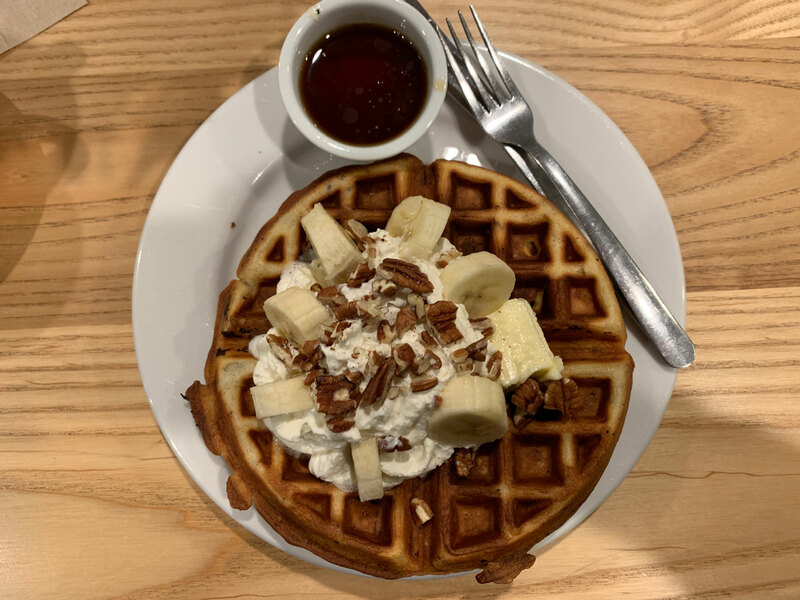 My choice was the “Southern Pecan Comfort,” a large bacon-infused Belgian waffle topped with pecans, bananas and whipped cream and served with maple syrup. It was a beautiful sight to behold and it tasted as good as it looked. The waffle was cooked to order on one of two waffle irons and it was loaded with plenty of the good stuff, as advertised. 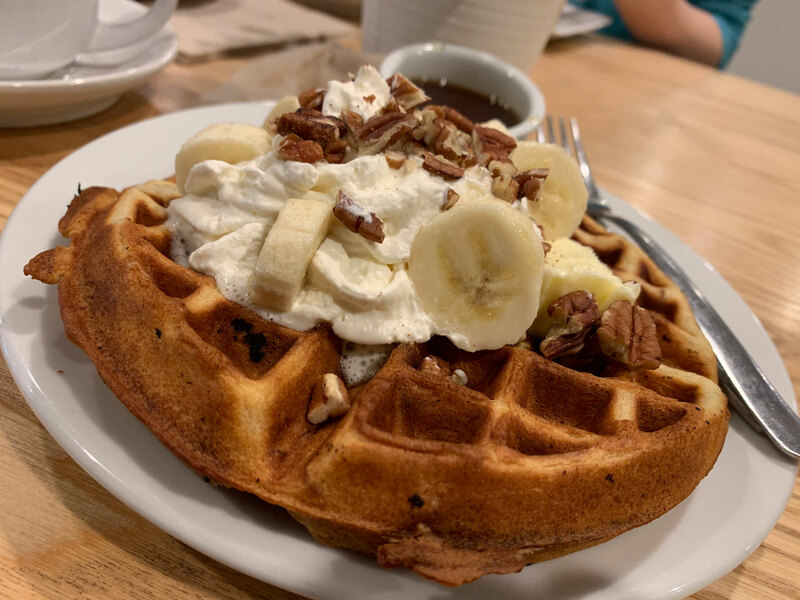 Pieces of bacon were cooked directly into the waffle offering surprises in many bites while the bananas and whipped cream created a sweet and savory balance that I really enjoyed. The pecans were a great addition, too, adding a nutty crunch to the soft foods on the plate. 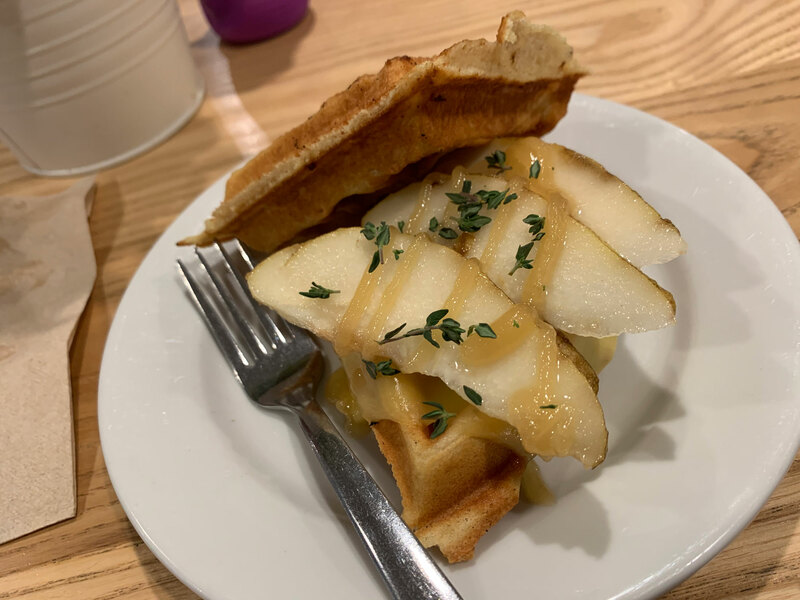 Julie opted for the “pear thyme” waffle sandwich. It was topped with sliced pears, gouda cheese, honey and thyme. Combined with what were mostly sweet toppings, the thyme really shone through, giving the sandwich an earthy depth of flavor. It was a very good and very hearty sandwich. For Jakob, our 16-month-old, we went with a simpler dish: cinnamon waffle sticks with cream cheese icing for dipping. It was a special for the day and it was perfect for him. Though some of the outer edges were a little too dark for him, he loved both the icing and the waffles. We enjoyed them, too, having to finish the order between us so as not to waste the sweet dippers. 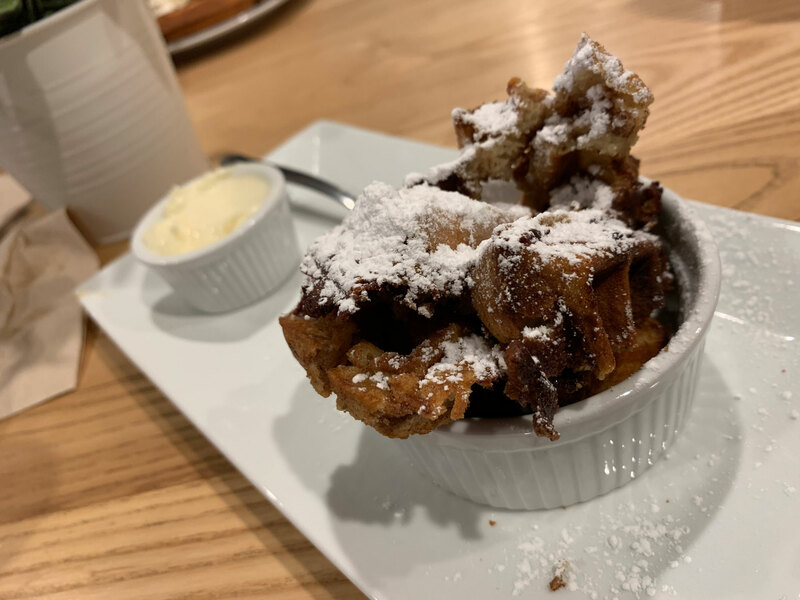 The waffles had a good amount of cinnamon and were delicious with the sweet cream on the side. All three of our breakfast orders were delicious and left us very full (Julie and I both skipped lunch. Jakob is a growing boy and was ready to eat again by the time we got home). And while it felt like we had been there all morning, it had only been an hour – our hunger upon arrival made it feel a lot longer. Our total bill was $28. But with two chais at $4 apiece, a little less than $20 for three breakfasts seems like a more than fair price, especially with as full as we were when we were finished. By the time we left, the runners had all been served and a steady stream of customers were flowing through the front door. 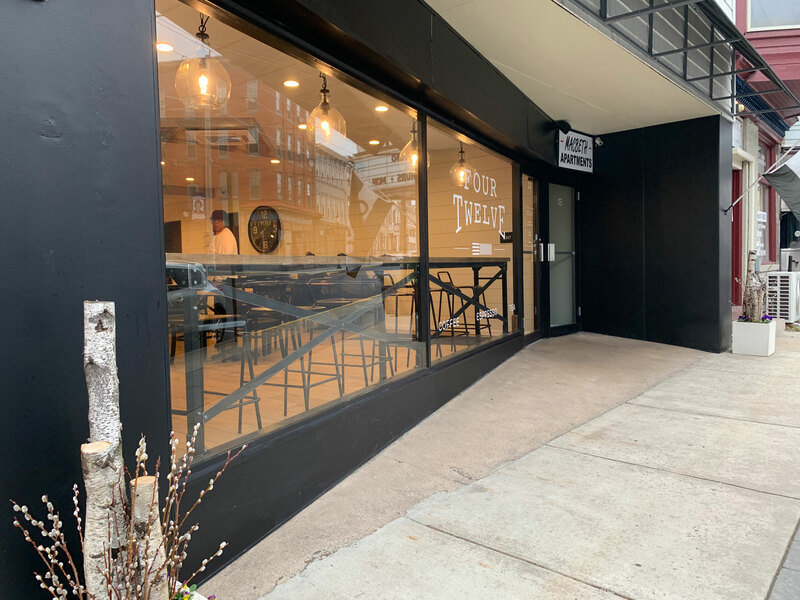 There is no question that Four Twelve is a popular gathering place for coffee drinkers and guests hungry for a hearty breakfast.